Kaup, Mar 26, 2015 : The annual Suggi Mari Pooja fest of the Kaup Hale Marigudi, Hosa Marigudi and third Marigudi was held with great religious fervour and devotion on March 24 and 25.The festivities concluded on Wednesday evening. Interestingly, thousands of devotees as usual took part in the fest amid apprehensions over the High Court ban on animal sacrifice during the festival. 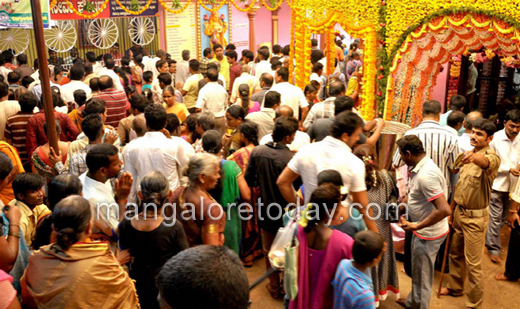 Devotees offered around 50,000 Guddige Pooja Seve and 15000 Kumkumarchane Seve to the Goddess during the festival. More interestingly, the devotees of the Goddess who were well aware of the High Court ban on animal sacrifice during the fair and considering the stern orders of the District Administration as well as the warning sign boards put up in this regard by the Marigudi management, voluntarily offered sacrifice of hens to the Goddess in the form of Harake in a private place and not outside the temple precincts. Meanwhile there were attempts by a few to offer sacrifice of hens in front of the Marigudi which was thwarted by the police. A total of 11 cases were registered and 36 taken into custody. Further investigations are underway.